Raw Data: Trades done by 2 Traders 1 and 2 in Dec. Ignore the SRC column – it represented the data source(brokerage account) for this exercise. My requirement is to present a Total Quantity Traded irrespective of Date along with the Qty which takes date into consideration. Here is how my view looks. 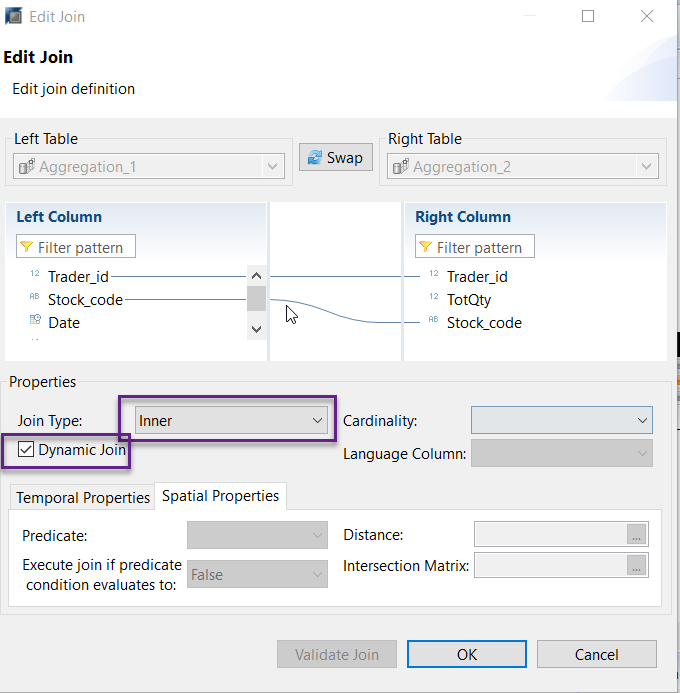 A dynamic join can only be defined on multi-column joins. For comparison purposes – I also have a view without the Dynamic Join being checked. and you need to be careful about your queries – for. e.g a cross where clause will bring the dimension into play and may not give you expected results for e.g. — here we are not changing the data set but just the introduction of the where clause causes both joins to come in play and mess up the results. hence it is important to test and document method of usage when using these smart features. In an adhoc scenario where query behavior is not predictable I would be tempted to leave this to the front tool. SAP BI tools like WebIntelligence can handle this elegantly.